Free-range parenting is having a moment in the national media, after neighbors in Silver Spring, Maryland, called the police to report that two children of the Meitiv family were frequently seen — gasp! — walking home from the park. Whether children need to be supervised all the time or should have the freedom to navigate their community is a surprisingly polarizing topic. Child kidnapping: In 1999 — the most recent year for which I can find coherent statistics – the number of children kidnapped in stereotypical “stranger danger” situations totaled 115, of a population of over 50 million US children. Most kids on milk boxes are the victims of parental abductions. Hell, kids are more likely to be killed by a parent than kidnapped by a stranger, per 3 decades of FBI data. Child pedestrian deaths: In 1999, 449 children under age 13 were killed in pedestrian or bicycle deaths, per the IIHS. In 2013, that number was 207, of a total population of 52,723,720 children in that age group. Child motor vehicle deaths: In 2013, 2,136 children under age 15 died in automobile crashes. Per the NHTSA, motor vehicle crashes are the leading cause of death for children of every age from 2 to 14 years old, killing 6 children every day. 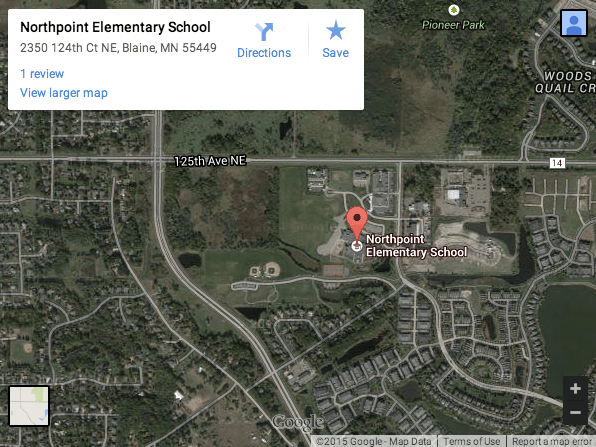 Meanwhile, we build unwalkable schools — we’ve featured several on streets.mn, including in Alexandria and Mankato. Here’s an example in Blaine, bordered on on one side by a large housing development with sidewalks and bike lanes, and on two sides with 4 to 6 lane stroads featuring 55+ speed limits and no crosswalks. Why are we building communities that are unsafe for our children? This goes beyond free range vs. helicopter parenting debates. Our infrastructure forces decisions by some parents — and are unhealthy for our children besides! Elsewhere on the Network today: Bike SD reports San Diego Mayor Kevin Faulconer says he wants his city to be considered one of the most bike-friendly in the world. Walkable West Palm Beach says the provision of free parking for all attendees at an upcoming transportation summit in Fort Lauderdale highlights broader policy mistakes. And Seattle Bike Blog shows off an important new protected bike lane segment the city recently added. What’s Really Dangerous for Kids? Hint: It Has Four Wheels and a Tailpipe.